Samurai films, like westerns, need not be familiar genre stories. They can expand to contain stories of ethical challenges and human tragedy. 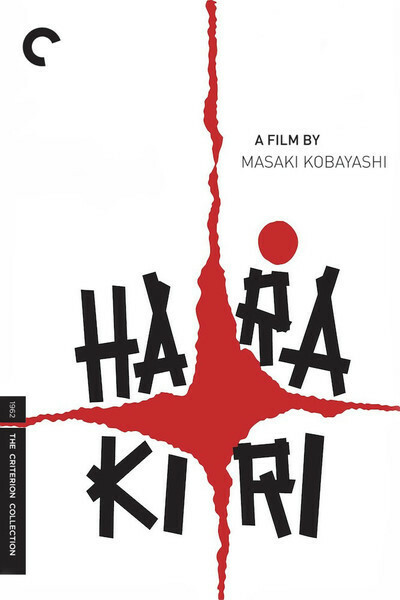 "Harakiri," one of the best of them, is about an older wandering samurai who takes his time to create an unanswerable dilemma for the elder of a powerful clan. By playing strictly within the rules of Bushido Code which governs the conduct of all samurai, he lures the powerful leader into a situation where sheer naked logic leaves him humiliated before his retainers. The time is 1630. Unemployed samurai, called ronin, wander the land. There is peace in Japan, and that leads to their unemployment. Their hearts, minds and swords have been pledged to their masters, and now they are cast adrift, unable to feed and shelter their families. It would be much the same with a corporation today, when a loyal employee with long tenure is "downsized." Loyalty runs only from the bottom up. At the gate of the official mansion of Lord Iyi, a shabby ronin named Tsugumo Hanshiro applies for an audience with the clan elder, Saito Kayegu (Rentaro Mikuni). He has been set loose by Lord Geishu and has no job. He requests permission to kill himself in the clan's forecourt. The ritual act is known as harakiri, or seppuku (which is the film's title in Japanese). It involves using a short blade for self-disembowelment. After the blade plunges in and slices from left to right, a designated master swordsman stands by to decapitate the samurai with one powerful stroke. Tsugumo desires to kill himself because of the disgrace of being an jobless samurai. Saito tells him a story designed to discourage this. In the district there have been many appeals like this, and in some cases the desperate samurais had their lives spared and were given work by the clan they appealed to. They didn't really want to commit harakiri at all. However, Saito says, many clans have wised up to this tactic. He tells a story of Chijiwa Motome (Akira Ishihama), another cast-off from Lord Geishu. He turned up not long ago here in this very forecourt, he says, asking the same permission. Saito granted it--but only if he performed the ritual immediately. Motome gave his word as a samurai that he would indeed kill himself, but asked permission to first pay a short personal visit. Saito saw this as a delaying tactic, and commanded Motome to disembowel himself then and there. This was not easy, because Motome had pawned his short sword, and had a cheap bamboo replacement. As a man of honor, he fell on this blunt blade and caused great damage and pain before being decapitated. So you see, Saito tells Tsugumo, you had better be sincere. "I assure you I'm quite sincere," Tsugumo says, "but first I request your permission to tell a story"--one that will be heard by Saito and the retainers of the household, who are seated solemnly around the edges of the courtyard. "Harakiri" was released in 1962, the work of Masaki Kobayashi (1916-1996), best known for "Kwaidan" (1965), an assembly of ghost stories that is among the most beautiful films I've seen. He also made the nine-hour epic "The Human Condition" (1959-1961) which was critical of the way the Bushido Code permeated Japanese life and helped create the state of mind which led to World War II. And he made "Samurai Rebellion" (1967), about a man who refuses to offer his wife to a superior. His recurring theme, seen clearly in "Harakiri," is that fanatic adherence to codes of honor, by granting them a value greater than life itself, sets up a situation where humanist values are forbidden. The samurai class eventually created the Japanese militarist class, whose members were so indoctrinated with worship of their superiors that the deaths of kamikaze pilots and the slaughter of soldiers in hopeless charges under fire were seen, not as military acts, but as a seeking for honorable death. The modern Japanese novelist Yukio Mishima was famously so devoted to the code that he saw its decay as the shame of Japan, and himself committed seppuku in 1970 after leading his small private army in an ill-advised uprising to restore the honor of the Emperor. The American writer-director Paul Schrader told his story in "Mishima: A Life in Four Chapters" (1985). Opening in a way similar to "Rashomon," in which a man arrives at a gate and begins telling one of four versions of the same story, Kobayashi makes a film where there is only one correct version of the story, but its meaning depends entirely on whose point of view you take. Who is right? Saito, who is determined not to have the charity of the Iyi clan exploited, or Tsugumo, who is determined that Saito and his household will hear the whole story of Motome which led up to his falling on his pathetic bamboo sword. It would be wrong for me to reveal the details of the story Tsugumo tells. What I can say is that it is heartbreaking. He explains that Motome was not a man trying to avoid death by the excuse of asking for a delay. He was a man whose actual honor humbles Saito and other authoritarian bureaucrats. Sometimes it takes more courage to do the right thing than to do the traditional thing. Following the Bushido Code frees its adherents from the need to arrive at their own moral conclusions. "Harakiri" is a film reflecting situational ethics, in which the better you know a man the more deeply you understand his motives. The telling of the story involves a feeling of ritual. Three times Tsugumo is given the privilege of choosing the master swordsman who will behead him. Three times a messenger to sent to fetch the man. Three times the messenger returns alone, with the news that the chosen man is feeling too ill today to survive. Tsugumo, who is obviously familiar with the retainers of the Iyi clan, doesn't seem very surprised. He will eventually explain the absence of the "sick" men by producing in the courtyard dramatic symbols of their lack of inner strength. This provides one of the great dramatic moments of all samurai films. It's important how the director Kobayashi's own life reflects Tsugumo's ideals. He was a lifelong pacifist, but his way of acting on his beliefs was not to avoid military service but to refuse promotion to the officer class, so that he would take his chances along with other conscripts. This black and white film is elegantly composed and photographed to reflect the values it contains. The camera often takes the POV of Saito, standing at the top of the stairs leading from the courtyard to the official residence, looking down from authority to Tsugumo the lowly petitioner. Then it will take a reverse POV of Tsugumo looking up to the man with the power. Angular shots incorporate the onlookers, who sit impassive and listen as their leader and the powerless ronin speak. Then, during a swordplay scene, a hand-held camera is used to suggest the breaking down of tarditional patterns It would take men with hearts of stone to resist being moved by Tsugumo's story, but these men have been born and bred to have such hearts. The fist image in the film will raise questions in the minds of viewers. We are looking at the symbol of the Iyi clan, the repository of its traditions and ancestors--an empty suit of armor. Eventually this symbol will be disgraced and exposed as the hollow man it is. And when we listen to the heartless reasoning of Saito, it is easy to draw parallels with more recent political debates where rigid economic theories of both left and right are cited as good reason to disregard human suffering. Also included in my Great Movies Collection: Kobayashi's "Samurai Rebellion," Kurasawa's "Rashomon" and Schrader's "Mishima: A Life in Four Chapters."